Just in case anyone hadn’t been keeping up, the new word for “pork barrelling” is “sandbagging”. Of course, it amounts to the same thing, but I guess may be lower in cholesterol. 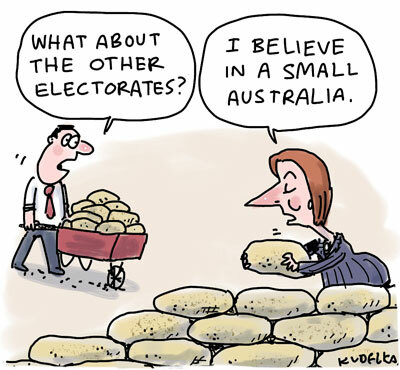 This cartoon features Julia, but of course the other side do it just as shamelessly, mainly because it works. Anyway, if you’re living in a marginal electorate, expect lots of lovely pressies over the next few days and if you don’t, well, stiff cheese. Can a boat jump a shark? Call me Ishmael if you like, but I can’t help thinking that our two aspiring leaders’ collective obsession with stopping the boats is becoming a little, well, obsessive. Part of the trouble could be that the issue of beating up on the small number of refugees that take the aquatic option is failing to capture the imagination of the non-bigot voter demographic. 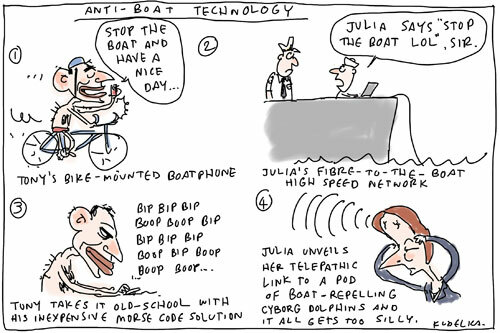 Julia did a marvellous job tying the NBN to healthcare, and I don’t see why the same thing can’t be done with boat people. 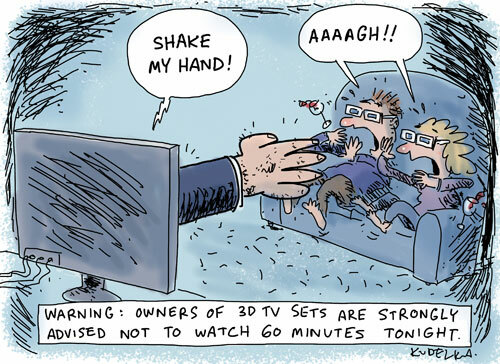 If Australians could watch high definition video of boats moving away from our shores at the rate of one gigabit per second in real time on their iPads, that would really help us all stand up for Australia and move forward together in an optimistic fashion. It would also neatly distract us from trivialities like whether it might be more polite to treat boatloads of asylum seekers as human beings rather than an opportunity to scrape up the pinhead vote in marginal electorates. Anyone up for another Great Tax Adventure? Apparently the guys in the expensive suits reckon the election campaign’s been a bit light on for tax reform so far, the gist being that they’d quite like to pay less of it. Fair enough, there’s nothing like a bit of tax reform to capture the public’s imagination, but if tax reform thinks it’s been a bit dudded for detailed policy attention in the past few weeks then it can bloody well take a number and join the queue like pretty much everything else. 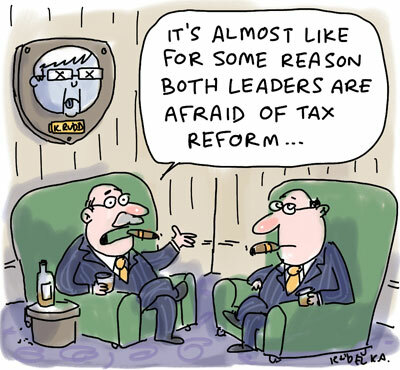 It’s also possible that Kevin’s head stuffed and mounted on the wall of the Mining Billionaires’ Club has put Julia and Tony off a little bit. There was also a bit of suspiciously WorkChoicey talk (between puffs of cigar smoke) that a touch more flexibility in Industrial Relations wouldn’t go astray. Bizarrely that too hasn’t had a big run so far, though John Howard’s head on a spike outside ACTU headquarters may provide a clue. Oh well, there are still a few days to go…. You’re watching The Expendables at Warringah Mall and during a really emotional bit someone’s bloody phone goes off (the ringtone’s probably Ride Of The Valkyries). Tony has decided to personally apply his vast nautical knowledge and experience to the vexed question of whether Turning The Boats Around will play well in Western Sydney at whatever point it is in the daily news cycle. Whenever there’s a life and death decision to be made out on the ocean wave, get Tony on the blower. 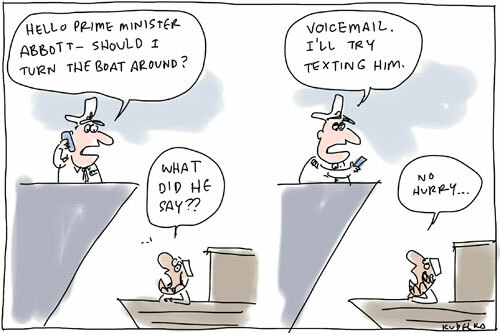 No doubt later today Julia will counter with a proposal to set up a call centre in East Timor to handle the situation. Personally I favour a live-action reality TV program like So You Think You Can Turn The Boats Around. Now that’s democratainment. If you can judge the quality of a man by his enemies, then someone who inspires the level of fear and loathing amongst politicians and journos that Mark Latham does must have something going for him. Hopefully his effort on 60 Minutes tonight will live up to the hype more successfully than his campaign in 2004.